Grapevine wreaths make a great natural base for seasonal and holiday wreaths. With a few quick changes, the wreath makes an inviting door ornament that reflects the current season or celebrates holidays. As inside decor, grapevine wreaths add charm, style and a down-home feel to any room. 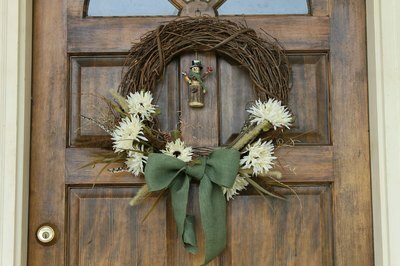 Keeping one or two wreaths to use as a base provides a quick starting point for holiday decorating. The key to reusing the wreath base is to attach decorations with wire or ribbon so they are easily replaced. Create a springtime wreath with brightly colored spring flowers. Visit your local craft store to review the selection of silk or dried flowers. Bright yellow daffodils, crocus, tulips and other spring blooming flowers are great choices. Silk leaves tucked between blooms add a natural touch. Make summer wreaths with summer blooming flowers like daisies, nasturtiums, cosmos or day lilies. These bold flowers create a cheerful wreath to welcome summer guests. 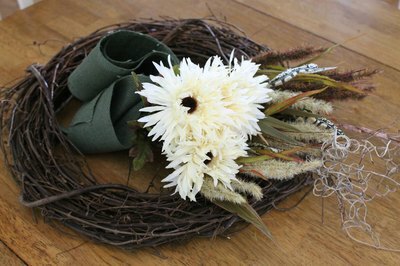 Fall wreaths adorned with colored leaves, sunflowers or nuts and seeds welcome the arrival of fall in style. Winter wreaths traditionally contain pinecones, sprigs of holy or evergreens and snowmen. 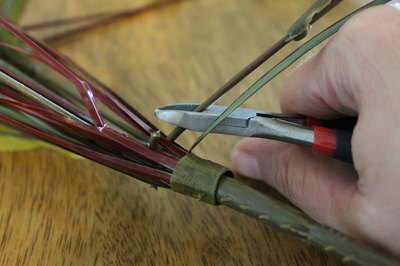 Clip the stems of the flowers or decorations to 3 to 4 inches with a pair of wire cutters or an old pair of scissors. Begin by adding one color to the wreath. It is best to space these evenly around the wreath. Simply tuck the stem into the wreath base so that it is anchored between sections of the vines. 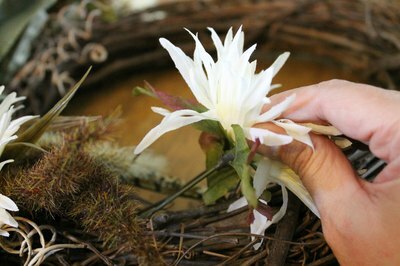 Add leaves to give the illusion of real flowers growing from the wreath. Continue to add flowers until you reach the desired fullness. Some prefer to cover the wreath completely while others prefer to leave sections of the natural vine showing through the flowers. Which you choose depends on personal preference. Holiday wreaths adorned with traditional holiday ornaments are a welcome change from simple seasonal wreaths. Visit the dollar store for inexpensive ornaments. Wooden cutouts ready for painting sold for a few cents at craft stores are a great way to personalize any wreath. Paint them to reflect your theme and attach them to a floral pick. Insert the pick between the sections of the vine. Create permanent wreaths by gluing the flowers and ornaments in place. 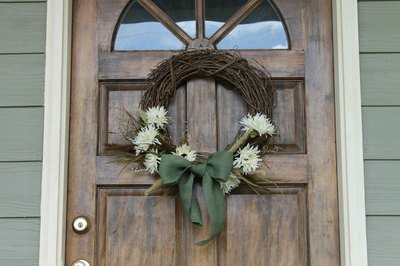 Permanent wreaths provide the advantage of being available whenever the season changes or a holiday approaches. The downside of permanent wreaths is you must have a place to store them. Changing the decorations on one or two wreath bases eliminates the need for storage and provides a cost effective way to display a new wreath for each season.